I know that I keep mentioning all the time that since I started my blog and joined Twitter I have discovered so many amazing new products and brands, well I have found yet another great new one. Attipas. If you have never heard of them then don't worry as nor had I until fairly recently, but I am so glad that I have discovered them now. You are probably wondering what Attipas is well it is a toddler shoe, but not just any old shoe its a cross between a shoe and a sock. It sounds weird but it actually really works, they look like really trendy socks but they have soft flexible rubber soles and are super lightweight. Making them perfect for toddlers as they keep little feet nice and safe and they won't slip over when wearing them like they often do wearing socks. This is what Attipas have to say about there toddler shoes. Attipas Functional shoes are a world first in toddler shoes. As light as a sock but more supportive than a pre-walker, these functional shoes ergonomically support toddlers first steps and thereafter. - Convenience: Strong, Smooth, Non-Slip, Machine Washable, Fast Drying. -Lightweight & Flexible: Super lightweight, just like wearing socks. Attipas have just launched a new look website which is really nice and you can view it yourself at www.attipas.co.uk .They have a lot of oh so pretty girly shoes and some super trendy little boy ones too. There really are so many lovely ones to choose from there is from pastel corsage ones to bright spots and stripes and little sneakers to nautical ones. My favourites from the new collections are the pink corsage and the anchor ones, I think they are super cute. 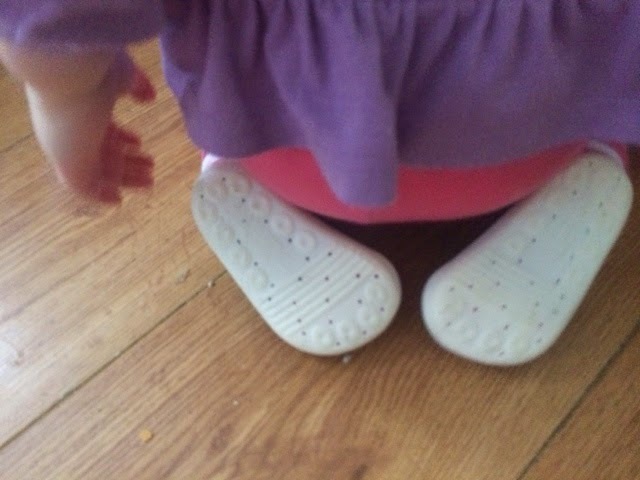 We were sent a pair of Attipas shoes for Sophia, who is 19 months old, to review and this is what we thought of them. When the shoes arrived I was surprised at just how light they felt. The sock part is really nice and soft and the rubber sole is really bendy. Sophia has a bit of an obsession with shoes and she wanted to wear them as soon as she saw them, they were really easy to put on just like putting on a sock. The sock part is stretchy and did not dig in or leave any kind of imprint on her skin. The rubber sole part had a lot of room and she looked really comfortable in them. She had no problems at all walking in the shoes like she sometimes does with new shoes. We were sent the lovely white rainbow ones and they went with most of Sophia's outfits she even wore them over her tights. What I liked about the shoes was that they offer protection to her delicate little feet, as I am always worried in case she stubs her toe or something but with these on I know her feet are safer. 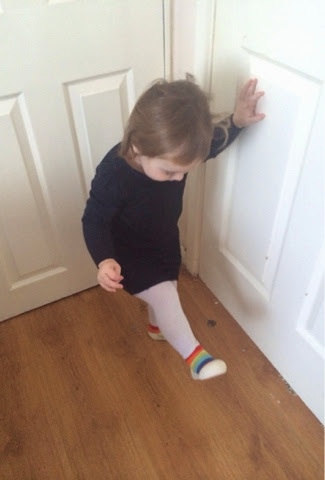 They are also non-slip so they are much better for her walking on the wood flooring we have throughout our house as she sometimes slips wearing just her socks. 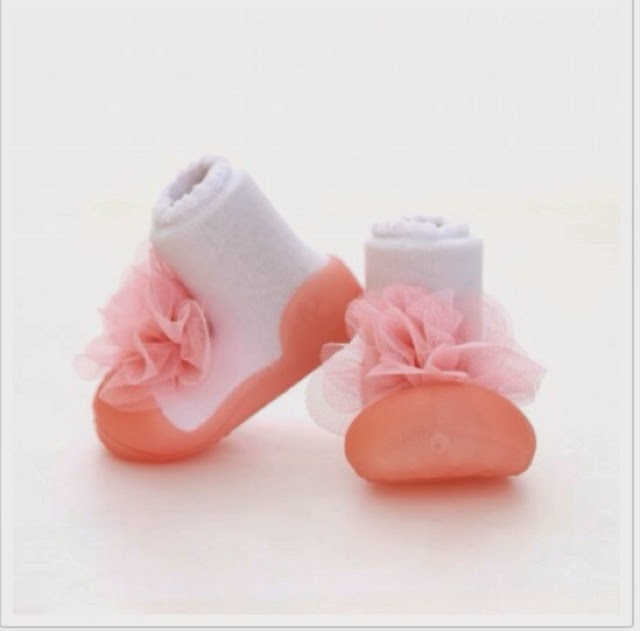 I think that these shoes would be perfect for that stage where your baby is starting to stand up and walk around but is not quite ready for shoes yet, as they will protect without being restrictive like other shoes can be. You can buy your own Attipas shoes from there website and they have a range of designs that come in three sizes small, medium or large. We were sent the medium ones for Sophia they are meant to be up to size 4.5 and Sophia is a size 5 with wide feet but they fit her perfectly. They are priced at £15.99 a pair. Attipas have very kindly offered one of my readers to win a pair of Attipas toddler shoes in any size or style they wish from the website. So to be in with a chance of winning just enter the Rafflecopter below. One winner will be chosen at random to win one pair of Attipas toddler shoes in any size and design they wish from the Attipas website. Winners will be notified via e-mail, winners will have two weeks to claim the prize before another winner will be chosen. UK entrants only. I would choose the Red Anchor Shoe thank you! I like the red anchor ones! Probably the Blue Sneaker Shoes. either leopard print or the pink new corsage ones so adorable! The red anchor ones. So cute! New pink corsage shoe. Well cute!! I love the Blue Sneaker Shoe. I like the White Rainbow Shoe - bright and colourful but also unisex so could pass them on after. Probably the Pink New Corsage Shoe but my daughter would have the final say for my grandaughter. The Pink New Corsage Shoe is lovely! I really like the red anchor shoe. Perfect for my little boy. They look really strange on their own, but once on they actually look really nice!